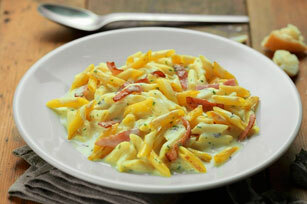 Cream cheese spread and grated Parmesan make a rich and creamy sauce for this tasty pasta dish. Add bacon, and it's a guaranteed family-pleaser! Heat broth and cream cheese spread in medium saucepan over medium heat 2 min. or until cream cheese is completely melted and mixture is well blended, stirring occasionally. Drain pasta; place in large bowl. Add sauce; toss to evenly coat pasta. Add Parmesan and bacon; mix lightly. Sprinkle with parsley. Add 2 cups small broccoli florets with the cream cheese spread. Cook sauce mixture 2 to 3 min. or until broccoli is crisp-tender. To easily snip leafy fresh herbs, such as parsley and cilantro, place the leaves in a small glass measuring cup or small bowl. Hold the cup in one hand, and, holding kitchen scissors in your other hand, snip the leaves right in the cup. Keep fresh herbs handy for use in preparing your favorite recipes. Chop the herbs, then place in separate freezer-weight food storage bags. Freeze up to 3 months before using as desired.